No one wants to have an accident. At O’Neill’s Body Shop, we understand the inconvenience and stress of auto repair services and strive to do everything we can to make the process as painless as possible. As every accident is different, we offer a wide range of professional auto body repair services, from collision repairs to wheel alignment, to expertly restore your vehicle to its original condition. Our affordable and hassle-free body shop services are designed to get you back on the road quickly. Great service starts with great people, and the dedicated staff and technicians at O’Neill’s Body Shop remain our greatest resource. All of our body shop technicians are licensed and insured and must meet rigorous quality standards at each stage of any repair. Combining proven techniques with ongoing training and certifications from industry leading organizations, our skilled craftsmen will restore your vehicle back to its pre-accident appearance. Grand Rapids car owners know that even a minor collision can put as big a dent in your wallet as in your bumper! 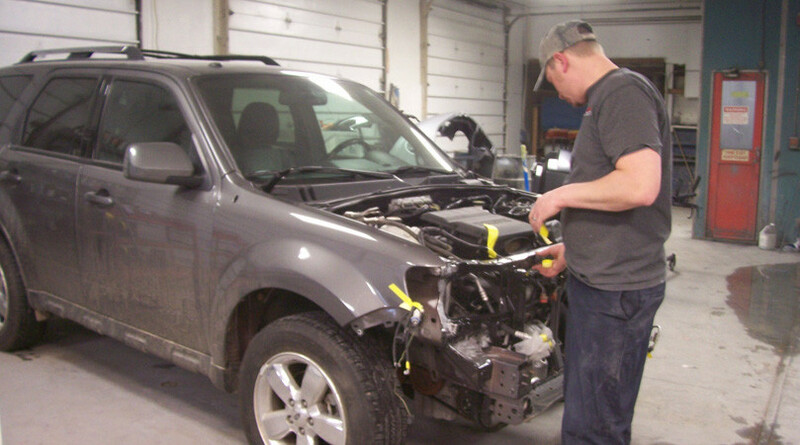 Our full-service Grand Rapids body shop specializes in collision repair and restoration of all makes and models of cars and trucks that have been involved in an accident. The expert technicians at O’Neill’s Body Shop can handle any collision-related vehicle repair — from minor cosmetic to major structural or electronic repairs — to help you get back on the road quickly. Learn more about Grand Rapids collision repair here. When your car looks good, it is more enjoyable to drive. The car painting specialists at our Grand Rapids body shop can tackle any vehicle painting job in our state-of-the-art auto painting bay. Normal wear and tear — in additional to accidents, scrapes, trees, deer and other immovable objects — can all combine to damage the painted surface of your car. In addition to keeping your car looking its best, scratches and scrapes in your car’s paint can diminish its resale value. Learn more about Grand Rapids auto painting here. Nothing ruins the overall appearance of your vehicle that a dent, no matter what size it is. At O’Neill’s Body Shop, we specialize in removing dents and dings from your vehicle? At O’Neill’s Body Shop, we offer professional paintless dent repair for all makes and models of cars and trucks. Our unique paintless dent repair process can save you both time and money and restore your car’s exterior panels to their original smooth finish. Learn more about Grand Rapids paintless dent repair here. Even small scratches on your car can be frustrating, unsightly and can decrease your vehicle’s resale value. Kid’s bikes, car keys, grocery carts and low hanging tree branches can all damage your car’s painted surfaces. When paint scratches occur, the scratch repair technicians at O’Neill’s Body Shop can help you return your car’s finish to its original shine. Our highly trained scratch technicians can handle any size auto scratch removal on all makes and models of cars and trucks, both foreign and domestic. If your car has chips and scratches on fenders, doors, hoods, side panels and bumpers, we can help. In many cases, our craftsman can even repair auto scratches without a full new coat of paint— saving you time and money and getting you back on the road quickly and without putting a dent in your wallet. If you’ve ever driven in West Michigan in April, you know how much punishment your car’s suspension takes from the numerous potholes and cracks on the roads you drive each day. The network of parts within your vehicle’s suspension system works together to give you a smooth, stable ride. Unfortunately, potholes, cracks and uneven pavement can wreak havoc on your car or truck’s suspension, causing the parts to wear out and even break. If your car does not drive as well as it used to, you may have a suspension issue. With today’s high-tech vehicles, we do not recommend that you diagnose suspension problems yourself. The suspension repair experts at O’Neill’s Body Shop are familiar with the auto suspension systems of a wide variety of vehicle makes and models. Does your car pull or drift away from a straight line when you let go of the wheel? Do your tires wear rapidly? If so, you may need a wheel alignment. At O’Neill’s Body Shop, we offer affordable wheel alignments for a wide range of cars and trucks. We can align your car quickly and efficiently so that you can get back on the road as soon as possible. Your car will definitely benefit from a professional wheel alignment, as you will notice increased gas mileage, better handling and additional protection for your tires. In addition, after O’Neill’s Body Shop technicians improve your alignment, you will have the peace and mind that you and your passengers will be safer every time you go for a ride. If you have been in an accident or if your car is not drivable, the dedicated staff at O’Neill’s Body Shop can arrange to have it towed to our repair facility. Not all towing companies are alike. We only work with certified and trusted towing companies so that you can rest assured that your vehicle will reach our lot without sustaining further damage that can add to the cost of repairs. Please contact us during normal business hours at 616.949.6840 to schedule a tow. If your dream car or truck has been gathering dust in your garage or pole barn, the restoration experts at O’Neill’s Body Shop can help. Our technicians have been restoring cars and trucks for nearly 50 years, and we want to help you get started on your car restoration project. We offer a full range of auto body restoration services designed to help you restore your vintage or antique car to its former glory. Our skilled technicians have the right tools, the right training and the years of experience to deliver exceptional results.